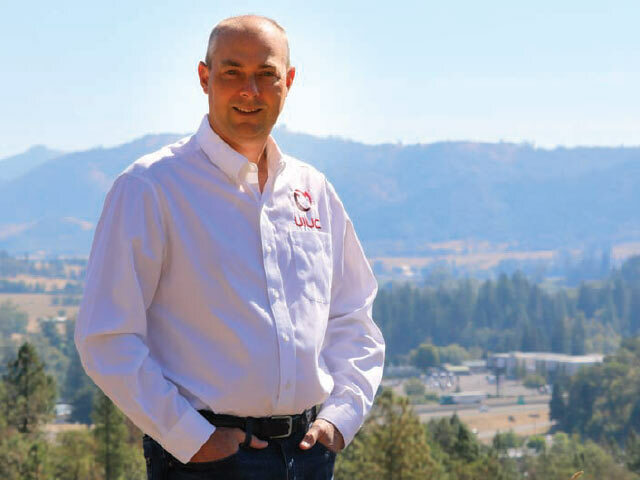 Lonnie Rainville is the operations officer of Umpqua Indian Utility Cooperative—and a tribal member. It’s a long way from the old bingo hall. The Seven Feathers Casino Resort is hard to miss as it emerges from the curvy, treelined landscape along Interstate 5 near Canyonville. The bingo hall started by the Cow Creek Band of Umpqua Tribe in 1992 is now one of Southern Oregon’s premier resorts, with a 68,000 square foot gaming area, high end restaurants and a luxurious spa. Visitors entering the casino are treated to Skookum Hyak, the world’s largest bronze casting of an eagle. But there is a lot more to the Cow Creek Band of the Umpqua Tribe than table games and bronze castings. In the 1800s, the tribe lived between the Cascade and Coast ranges in Southwestern Oregon, and along the South Umpqua River and its feeder stream, Cow Creek. They were a mobile and highly resourceful tribe, but survival became difficult in the 1850s when miners descended upon their land after gold was discovered. Epidemics swept through their villages, killing members of the tribe, including their chief. Tribal members were disbursed by settling homesteaders, but seven families continued traditional ways, meeting throughout the years to celebrate and honor their traditions. The Seven Feathers Casino Resort is named after the families that kept the traditions alive. Today, after a protracted battle with the federal government, the Cow Creek Band of Umpqua Tribe of Indians is one of nine federally recognized Indian tribal governments in Oregon. The tribe’s rich tradition of hard work and innovation is not only alive, it is thriving through several tribal businesses that are not as visible as the resort. Among other ventures, the Cow Creek Tribe operates a truck and travel center, a ranch and a motel. Its 26 acre Seven Feathers recreational vehicle resort is one of the few RV parks in the country to receive the coveted “101010” highest rating by Sam’s Club. 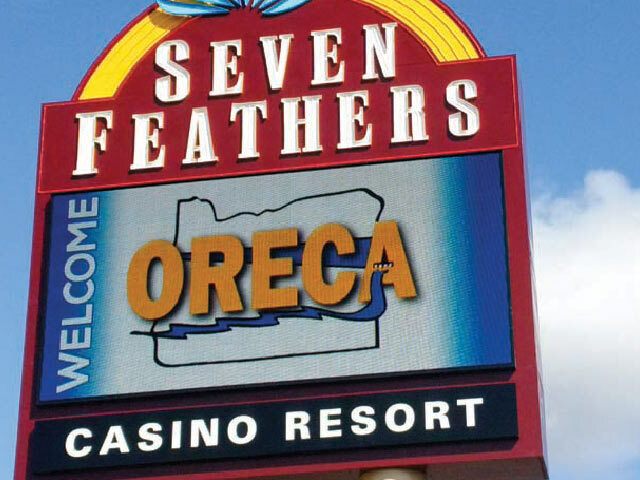 This July, Seven Feathers Casino Resort hosted the Oregon Rural Electric Cooperative Association’s summer meeting. Through these enterprises, the tribe controls its own destiny by providing jobs, health care and education for its members, aided by one of the most unique utilities in the Pacific Northwest: the Umpqua Indian Utility Cooperative. The year 1992 was not only an important year for the advent of the bingo hall, it was the same year Congress passed the Energy Policy Act, which included a provision allowing tribes to form their own utility if they met certain criteria. The Cow Creek Band was interested in forming a utility to keep its costs down, to exercise the tribe’s sovereign rights, and because existing water and sewer utilities limited their ability to expand. On the electric side, the tribe was interested in gaining access to renewable and affordable hydropower marketed by the Bonneville Power Administration. As a customer of Pacific Power, they had to create a public or cooperative entity to receive the benefits of BPA power. UIUC was formed in October 2001 and began serving the wholesale electrical loads at the casino and truck stop. It is one of only two tribal utilities in the Northwest. The other serves the Yakama Nation in Washington. “It made sense on a number of fronts,” says Lonnie Rainville, general manager of UIUC. Rainville, who is also a member of the Cow Creek Tribe, went to high school in nearby Myrtle Creek and finished his degree at Western Oregon University before returning to work with the tribe in human resources. He took over the utility position in 2014, leading a group of 14 people who are involved in what Rainville calls a “three pronged utility” with water, wastewater and electric services. The tribe has seen significant cost savings from forming its own utility. Since 2008, the tribe has saved more than $1.6 million on both potable water and wastewater. But UIUC’s savings on the electric side has been particularly notable—more than $13 million since 2008 by buying their electricity from BPA instead of higher cost Pacific Power. UIUC’s electric distribution system—which is all buried underground—not only serves the energy intensive casino, but a small data center and some commercial buildings. Through all of these ventures, Rainville says the focus remains on the nearly 1,750 members of the Cow Creek Band of Umpqua Tribe, including programs to enhance economic opportunities and keep their heritage alive. Education has been an important component of this assistance. While Rainville clearly takes pride in what the tribe has accomplished, there are other projects on the horizon. Just as the tribe was highly mobile and resourceful two centuries ago, there is a sense that UIUC must continue this tradition of self reliance by finding innovative solutions. We’re always improving what the tribe can do for our membership,” Rainville says.